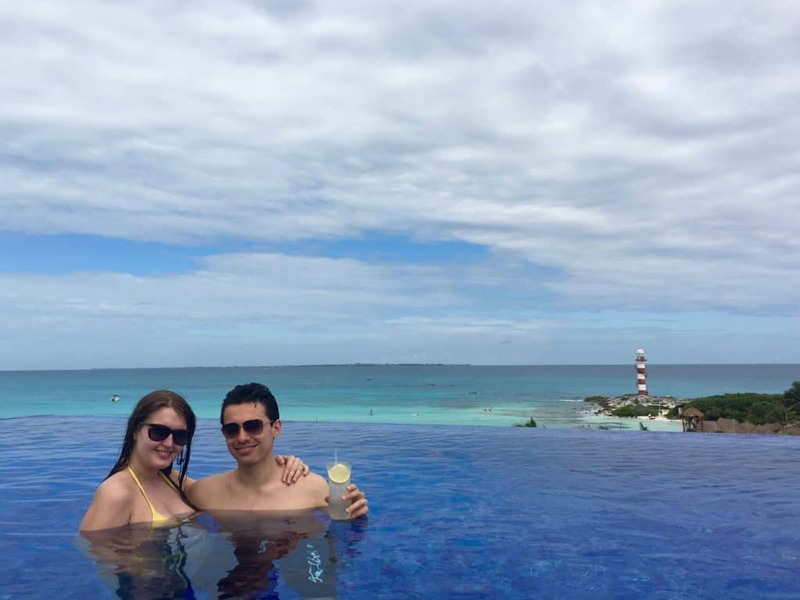 If your Big Day is approaching and you’re looking for some honeymoon inspiration, look no further, in this post, I will tell you where to have a honeymoon in Mexico and share with you our experience of a truly unforgettable honeymoon in Riviera Maya and Cancun, Mexico. Getting married in Mexico: was it a hussle? I have a separate post about getting married in Mexico (read it here). Actually, getting married in Mexico was pretty easy and straightforward, almost as easy as in Las Vegas. All we needed to provide were birth certificates and passports. We didn’t have a church wedding though, just a “normal” civil ceremony, but I was really happy with it. Our wedding took place in Mexico City, however, there are plenty of wedding packages that you can get and have an unforgettable wedding in Mexico in a more popular place like Cancun, Riviera Maya or Los Cabos. Where to honeymoon in Mexico? Mexico is a wonderful place for a honeymoon: it has so many amazing tropical destinations: from Oaxaca to Baja California, from Chiapas to Merida, from Acapulco to Cancun. There are amazing waterfalls, ice caves and even pink lakes in Mexico! However, if you haven’t been to Mexico before and you want an easy yet incredible and unforgettable tropical honeymoon, Riviera Maya would be the best option. 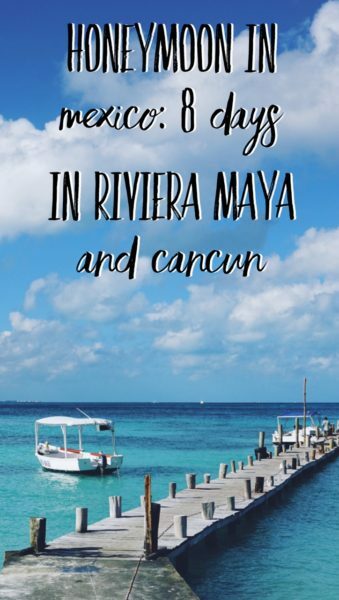 You can also choose from Tulum and Cancun that are located nearby (in fact, Tulum is a part of Riviera Maya) and if you would like some more information, head to my post about Cancun vs Riviera Maya, where I explain in detail, what are the differences between these two tropical destinations. We were planning our honeymoon just 2 weeks beforehand, so we were limited in our options of locations in Mexico. We wanted it to be special, but at the same time easy to reach, so we decided to stay in Riviera Maya and later move to Cancun. There are so many flights to Cancun from all around the world and they are generally affordable – check the availability and the prices of the flights to Cancun now! We decided to split our 8-day honeymoon in two parts and stay 4 days in Riviera Maya and 4 days in Cancin. That was a good decision because Cancun and Akumal in Riviera Maya (where our hotel was located) are quite far from each other (2 hours driving). While staying in Riviera Maya, we managed to visit Tulum and 4 different cenotes. A cenote is a natural cave with the crystal clear water, where you can usually swim or snorkel and have a huge change to encounter bats (in case it’s a “closed” denote). Cenotes are truly wonderful and I definitely suggest you visit some during your honeymoon in Riviera Maya! Here’a great tour where you can visit 4 cenotes in one day (check the availability and prices now – they usually sell out pretty quickly). This time, we didn’t visit any parks like Xel-Ha or Xcaret (if you want to check our review of Xcaret, check this post), and stayed 2 remaining days (out of 4) in our hotel. Since we were choosing our hotel just 2 weeks before the honeymoon, and it included the New Year’s night, the prices were rocketing and there were only 16 remaining hotels. We chose Gran Bahia Principe Coba as the we liked it most out of the available hotels. However, if you book in advance, check this list of the dreamy resorts in Riviera Maya. Gran Bahia Principe is just enormously big: it consists of 3 different hotels: Coba, Tulum, and Akumal. The guests of Coba are quite far from the beach and while the closest beach is the one from Grand Bahia Akumal, it wasn’t allowed to use it. I wouldn’t say that Gran Bahia Principe is the best hotel for a honeymoon – it’s too crowded and full of families with little kids. If you’re looking for a more exclusive honeymoon, you could check hotels like Gran Palladium or Mayakoba, but the price for them is usually way higher. However, the New Year Celebration in Gran Bahia was really great, you could see it in the video at the end of this post. After staying for 4 days in Riviera Maya, we moved to Cancun for another 4 days. Cancun doesn’t have jungle, cenotes and that many animals freely running around the resorts, but it has amazing beaches, great entertainment and it’s easier to get there, as it’s just 20 minutes away from the airport! The second hotel during our honeymoon in Mexico (this time in Cancun) was incredible. We stayed at Hyatt Ziva Cancun, that was built on 2 beaches, one of which was the most beautiful beach I’ve seen in my life (update 2019: I loved beaches in the Maldives a bit more in the end – here’s more about our experience in the Maldives). The hotel wasn’t as crowded as Gran Bahia and of course, it was much smaller. What we liked about Hyatt Ziva most is that it has an adult only tower, spa and an infinity pool with a separate lounge on the 3rd floor. It was perfect for a honeymoon! While there were often no free beds on the beach, we were always able to find a comfortable double bed in the adult only zone upstairs. The room was very modern, huge and had a spa bath on the balcony. What a view! Also, the hotel had room service free of charge, so it was possible to ask for the favorite cocktail anytime. We were surprised how good the alcohol was in Hyatt Ziva: they had the best tequilas and vodkas (Grey Goose, Belvedere) and could prepare really elaborate cocktails. My favorite was the cucumber Margarita from the Tequila Bar downstairs – it was just the best of the best. Cancun has a great nightlife and a huge Coco Bongo club (with some cool shows). Also, there are a couple of shopping malls nearby and some interesting bars. To summarize, I would say that I totally loved our honeymoon in Riviera Maya and Cancun, I just wish it was a bit longer, so we could finally go to Las Coloradas and Chichen Itza. Liked this post about the honeymoon in Mexico? Save it on Pinterest! Wow feeling very excitement after reading your topic. We have also planned to go for a vacation to Mexico but couldnot decide the right place for the tour. But now I plan to go Riviera Maya with my family. As am new to that place so I have to set the transport structure from the airport & My friend suggested me to book Nasttransfers for transportation. I think I will do it by today & thanks for sharing your experiences.